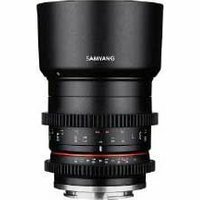 The manual focus Samyang 35mm T1.3 ED AS UMC cine lens is designed for Fujifilm Compact System Cameras, and features a bright T1.3 aperture to ensure brilliant image quality. With 9 elements in 7 groups, the construction includes 2 aspherical lenses to minimise aberration. The versatile 35mm focal length is suitable for landscapes, street scenes, and portrait photography among other applications.